SUNGLASSES Le Specs. TEE 3.1 Phillip Lim (tanktop version here). WAX COATED JEANS Zara (similar ones here). BAG Proenza Schouler. BOOTS Din Sko (old but similar ones here). WATCH Nixon. ID BRACELET Asos. RINGS Asos. This entry was posted in Outfit and tagged 3.1 phillip lim, le specs, Proenza Schouler by Carolina Engman. Bookmark the permalink. So beautiful with these touches of color! Great look! Beautiful photos! I’m loving the mirrored sunnies trend. Great glasses! Ohh, I love that tee! I wish I’d grabbed one earlier this year. Love this look on you! Cool sunglasses! I’ve got similar ones in black. Great for summer! nice glasses! in love with your phillip lim shirt! I absolutely love this look! Gorgeous tee!!! in love with the sunglasses!!! You rock these mirror sunnies and your skin looks fantastic with the red lippy! I hope your rib gets well soon! Does it hurt? Really nice outfit! Your boots are so cool and I really like your sunglasses!! love the sunnies :) and could you please tell me what kind of lipstick you use? I want that exact shade! You look great! Love your sunnies and the top is so cute! Love your sunnies & shirt ! you look gorgoeus ! 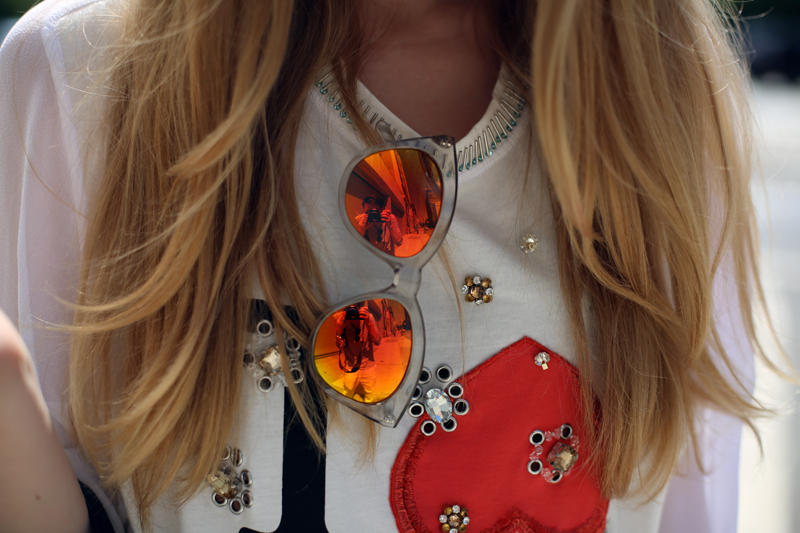 Loved the mirrored shades and the shirt ! OMG I really love your T-shirt. You are so elegant! Loving this look the reflection in the glasses are perfect with the lip color! The red lispstick fits perfectly on you, honey! this post is particularly beautiful! love it!! love the outfit and the pictures! amazing! Love it! You look so good in these pics! Love these shots, they’re beautiful!!!!!! gorgeous shades, love your look! I love this outfit! WOW! super pretty! So incredibly pretty! I love the top! Gorgeous shades. They look great with the rouge lips and top. You look so beautiful here!Great look! Love the glasses! I want a pair! Love the embellished Phillip Lim shirt with the red lipstick. Looks great! So in love with your top, its amazing!! I really love your sunglasses and your tee! I am smitten with your Phillip Lim top and the mirrored sunglasses by Le Specs, I wish I could pull off those sunnies as well as you do, the frames are perfect on you! Love those sunnies and THAT shirt! You look gorgeous in that shirt!! Love the outfit! always love a red lip! You look so perfect – really beautiful! Oh god I want the Phillip Lim tee! Love the outfit and the setting of the picture is perfect. This pictures are so beautiful & your blog too;) I wish I would have a blog like yours. Hello Carolina, I’m a new reader of yours. Can I ask you what lens did the photographer use to take these shots? They look stunning. And what lipstick are you wearing? I fell in love with this shirt :) I already saw a similar version at Andy and it looks so adorble !